Host a dog birthday party and make a cake for the guest of honor. 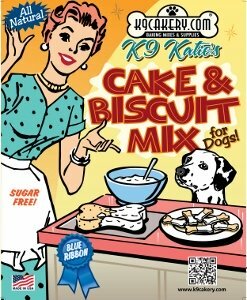 Find a fun dog birthday cake recipe. Or, as a great alternative, offer each guest his or her own mini dog cake. Use the 6 paw silicone baking pan. Each paw shaped mini cake is the perfect size. You will have fun decorating the paws with your original ideas using frosting, sprinkles, shredded coconuts, sesame seeds, or other decorations. Use dog themed napkins and plates for your human guests, and make up doggie bags for the four-legged ones. A dog party tip: only invite guests who will behave around other dogs! Also, make sure to have a place that can serve as a doggy rest room. You may want to have this party in a park if your yard is not very large. Watch the video below for an idea for a fun dog party game: bobbing for biscuits. The dog owners love watching their own pet compete. Allow one dog at a time. The audience will get a huge kick out of it as you can see from this video of the game held at the National Dog Party Day celebration in San Diego. All the participant dogs had a great time! All the participant dog owners had a great time watching the participant dogs participate! Throw a dog birthday party using a dog theme for something different, especially if one of your friends is an ardent dog lover or has a dog related business. If you are a dog lover yourself, you probably already have your own set of dog cookie cutters or special dog bone cookie cutters. It will take a little bit of work, but you can easily roll out cookie dough and cut out the dog bone shapes. Decorate with jimmies or drizzle cake icing. 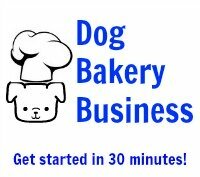 At the same time, make up a batch of dog cookies using a dog biscuit mix for your honored guest to take home for the pets. Make the birthday cake using a dog bone cake pan like the one below. Your guests will really get a kick out of your creativity! 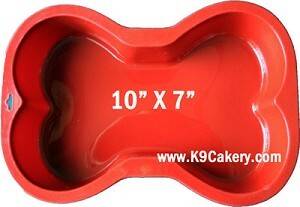 This silicone cake pan will make a full size dog bone shaped cake and can be easily washed in the dishwasher. Make little mini paw print cakes or biscuits palatable to human tastebuds with the mini paw print cake pan. Firemen are associated with dalmatians who are often depicted riding on the firetruck. These dalmatian candles depict the happy firedog and would be the perfect complement not only for a dog birthday party but to grace the birthday cake for a fireman party! The association of a dalmatian riding with firemen goes back to the 1700's. The dalmatian was used as a guard dog to protect the horses which pulled the carriage with the water supply. These dogs bonded well with horses and were felt to have a calming effect on them. They were considered the horses' pets. In addition, dalmatians had the speed and energy to run alongside the horses without getting tired. They are known to be loyal dogs, and highly protective of their owners. Children love dalmatians - the spots are cause for questions. We even heard one child, after seeing a dalmatian for the first time, tell her mother that the doggy was dirty and needed a bath!